Welcome Back, Lisbeth!! | annie's got a clue . . . I spent my weekend with Lisbeth Salander. How about you? 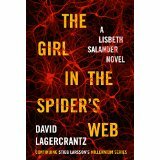 For those of you who haven’t been living under a rock for the past year, David Lagercrantz has just released the long-awaited continuation to Steig Larsson’s Millennium Trilogy, The Girl in the Spider’s Web. When the worst I can think of to say about a book is that I was mightily pissed off that I finished it so quickly, it is a good book. That was this book. Lagercrantz brilliantly continues the series, reminding us why we care so much about Mikael Blomkvist and Lisbeth Salander — really, really care about Lisbeth Salander. To be sure, the writing isn’t exactly the same. And that’s fine, good even. I don’t think I would have liked it if Lagercrantz had tried to write as Larsson. But, he remained true to the characters. The crazy, unpredictable, ruthless, loyalty of Salander shines as brightly as ever against the gloomy Swedish backdrop. Blomkvist’s passion and style are also in fine form. Like the first three books in the trilogy, this one starts in high gear and never shifts down. The reader is teased with deep, overlapping conspiracies — most of which are revealed by book’s end — involving artificial intelligence, corporate espionage, cyber-security and autistic savantism. Any one of these themes could support a high-paced, page turning mystery. All of them combined gives us the heart-thumping fix we’ve come to expect from this series. By far the most interesting new character is August Balder, a beautiful eight year old autistic mute who turns out to have the answers to more than one of the mysteries haunting this book. The book’s ending suggests that August may make future appearances, and I look forward to discovering how August has developed and progressed in the interim. By far the most interesting recurring, supporting player is Camilla, Lisbeth’s twin sister. Lagercrantz thankfully reminds us of the series’ characters with a quick overview at the beginning of the book. And, I admit that I had kind of forgotten about Camilla. Her back story takes front and center and offers a fascinating glimpse into the events and figures that have shaped Salander into perhaps the most memorable female fictional character, well, ever. There I said it. Ever. Salander’s mind is unparalleled and her unwavering driving force is both awesome and inexplicable. Kudos to Lagercrantz for not quelling or softening her rough, rough, rough edges. Like all of the books in this series, greed and power take a starring role. Though life doesn’t always mirror these books, it is a fun and satisfying escape to see the greedy power-mongers unmasked and defeated before the last page is turned. Can’t wait for the next installment — I hope you can hear me, David Lagercrantz, and are busy writing away. Pick up The Girl in the Spider’s Web now, but really only open it when you have no other deadlines or obligations looming because you won’t want to put it down. Happy Reading!